Horizontal multi-stage close coupled pumps deliver excellent performance with minimal noise. Single piece barrel casing in chrome nickel stainless steel, with front suction port above pumps axis and radial delivery at top. 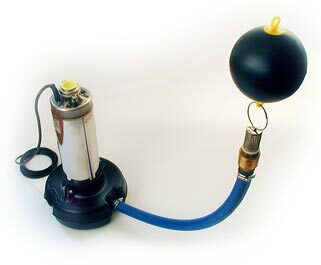 Available with flow controller for automatic operation or can be used with standard pressure switch and tank. A range of flowrates and voltages provide flexibility in meeting your pumping demands. Shown here with special base and floating inlet filter, the close coupled multi-stage submersible pump in chrome nickel stainless steel, specifically designed for use inside rainwater storage tanks. 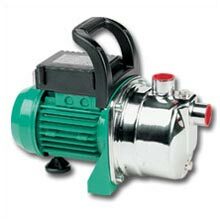 Motor cooled by the pumped water passing between the motor jacket and the external jacket. 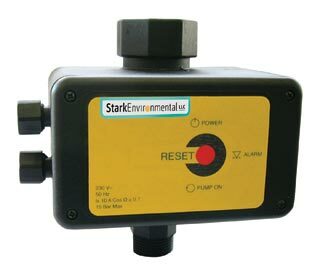 Available with flow controller for automatic operation or can be used with standard pressure switch and tank. A range of flowrates and voltages provide flexibility in meeting your pumping demands. Electronic controller with integral flow regulation turns pump on and off when points of use are opened and closed while providing constant pressure without the need for additional pressure vessels along with built in dry run protection for your pump. Available in a range of cut-in and cut-out pressures. This universal pneumatic level gauge can be used for remote indication up to a distance of 165 feet. The unit features capsule movement, a measuring accuracy with ±3%, zero correction adjustment and overpressure safety control. It is fully adjustable for tank heights between 3 and 9 feet. A reference pointer is provided for easy monitoring of consumption. The high impact resistant plastic housing is designed for wall mounting. The standard gauge displays percentage of filling height. Custom scales are available at an additional cost. 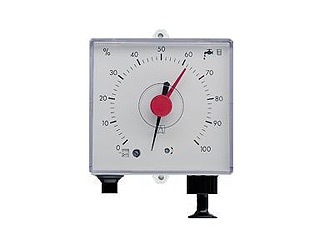 The gauge is available separately or included within a complete installation kit. No power is required for operation.